Blossoming flowers of various hues, neatly trimmed trees and pathways make up the beauty of the Queen Elizabeth II Gardens in the City of Regina, Saskatchewan. At the end of the gardens, the historical building home to the Legislative Building, makes this area one that is visited often by tourists to the City of Regina. Various types of flowers are planted in the Queen Elizabeth II Gardens and during the spring and summer months, the blossoming of them creates a picture of beauty. The air is filled with a mixture of scents and pathways around the garden make it easy for people to enjoy a walk. The Queen Elizabeth II Gardens are regularly used by photographers, walkers, runners and bikers as well as people wanting to relax on the benches and enjoy the scenery of the blossoming flowers. In a formal laid out setting, the gardens are tended to regularly by professional gardeners, keeping the area around the Legislative Building very clean and picturesque. 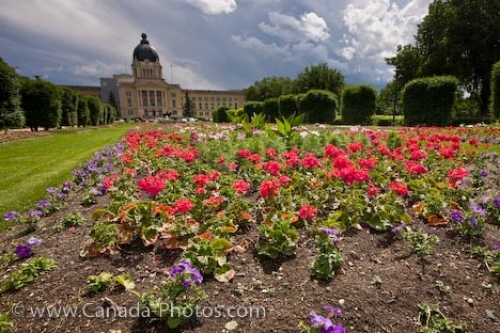 Picture of the blossoming flowers in the Queen Elizabeth II Gardens in the City of Regina in Saskatchewan, Canada.